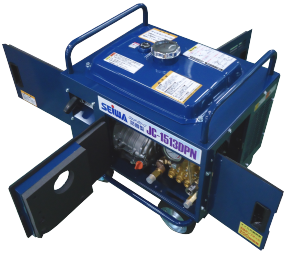 Diaphragm Airless Paint Sprayer, a Professional’s Choice | Seiwa Spray Pump Inc.
TB-8 boosts working efficiency by 20% by spraying with high volume & low pressure. Spraying with low pressure makes it possible to achieve less splatter, which leads to economical advantage due to less paint wasted and also less harmful substance exposed to the user. TB-8 is your choice for our eco-friendly era. ② Easy handling and maintenance. 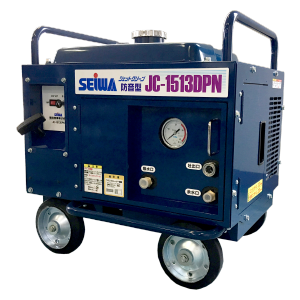 ③ High volume and low pressure airless paint sprayer is Seiwa’s original product. Even if the pressure is lowered to as low as 40kgf/cm2(4MPa), coating is even from start to finish. 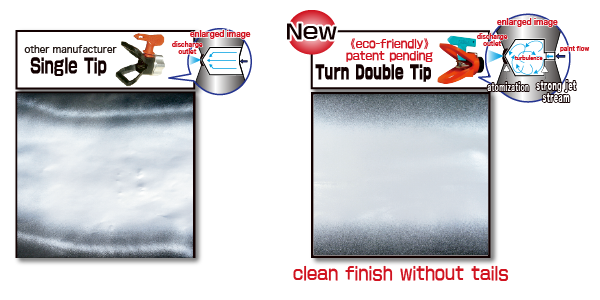 In addition, by using Seiwa’s original “turn double tip”, spray tails can be avoided completely and wasted paint is hugely reduced. We believe TB-8 can bring profit to painting business because beside the reduced amount of paint used, jobs can be completed much faster compared to painting through the conventional way which also requires more manpower. There is an impression that cleaning an airless paint sprayer takes a lot of time and uses up plenty of water. In most cases, the inside of the hose is not fully cleaned and there is a difficulty in disposing the contaminated water. To solve the mentioned problem, here we will also guide you on how to clean your airless paint sprayer with just 1 liter of water and 2 minutes of your time! ① High durability pump airless paint that can withstand with coarse paint. (the result would not be as good when using a suction hose ). ③ At the same time, paint hose can also be easily cleaned. to needed amount and still maintaining the less splatter advantage. the same time and achieve the same even coating. The flow rate of TB-8 is 7.2 liter/min. Compared to previous model that uses higher pressure with flow rate of 6 liter/min, TB-8 surpasses the amount by 1.2 liter for every minute. Thanks to the higher flow rate, this sprayer can be used to spray heat insulation paint. Thick layer coating can also be done in just a single spray time and by just replacing the airless spray gun with a pressure feed roller or a pattern spray gun, TB-8 can cover various painting jobs. Airless paint sprayer that is equipped with a diaphragm pump and used in low pressure also proves to have a higher durability because consumables can last longer. For 100V class airless paint sprayer, TB-8 has the highest flow rate in Japan. Paint hose can be extended (for high viscosity paint, up to 80m) and still maintain the same steady flow rate. SEIWA‘s original “turn double tip” allows an even coating even when the pressure is set as low as 40kgf/cm2(4MPa). In the past, to achieve a higher productivity, spraying with high pressure is the most favored method. However, spraying using high pressure makes paint rebound, staining the surroundings. On top of that, the paint also does not stick well to the surface. This method wastes paint and pollutes the environment. Due to this reasoning, there is a general assumption that airless paint sprayer is not suitable for residential neighborhood or any urban areas. To clear this misunderstanding, SEIWA introduces TB-8, an airless paint sprayer installed with a high capacity pump, as a new low pressure spraying method with less splatter but still gives out a high discharge volume for a productive painting job. Combined TB-8 with a pressure feed roller, even coating can be achieved in a stable, no fluctuating pressure. Spraying with low pressure of 4~5 MPa, paint rebound is greatly reduced and even if the airless spray gun’s trigger stays gripped when moving it around, the coating is even because the pressure stays stable from the beginning to the end of job. Low pressure spraying makes it possible to cut down the amount of paint used. This is what TB-8, a high volume low pressure diaphragm airless paint sprayer, presents for the most effective spray painting. ① Less space required and a hassle-free cleaning up. ② Paint is used up to the last drop. No paint is wasted. ④ No suction hose is needed, making it the best choice for a limited working space. 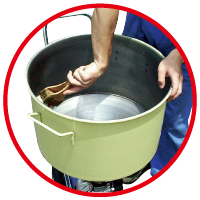 ① Fill hopper with half the water from a bucket. ② Using a duster brush, clean the inner side of the hopper. ③ After cleaning the hopper, run the airless paint sprayer and flush the dirty water out from the gun. and run the airless paint sprayer again, flushing out the retaining paint inside the hose. Cleaning when using a suction hose method, the remaining paint inside the hose cannot be completely taken out as clean as using a hopper. The step between the thick part and the axis of Seiwa’s Diaphragm is smoothed out to let the pressure spread evenly, with general paint, this high durability diaphragm can be used up to 1,000 hours (company data) without any worries of damage (patent application in process). No wear down in the sliding pump, the sliding part (piston and cylinder) in the hydraulic pump is always in oiled state making it highly durable and no maintenance is required. Diaphragm airless paint sprayer works best with pressure feed roller, using low pressure, flow rate and productivity is significantly increased. Taking the surroundings into consideration, painting with rollers are often seen in renovation works at residential areas. Painting a wide area within a short time while not rising the price and suppressing the labor cost as much as possible is hard to attain. 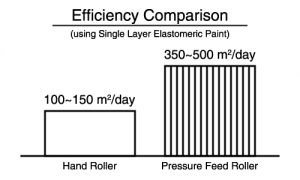 The best way of painting to fit this situation is by using the pressure feed roller. Diaphragm airless paint sprayer has such a high discharge volume that painters has to speed up in order to catch up with the flow speed. 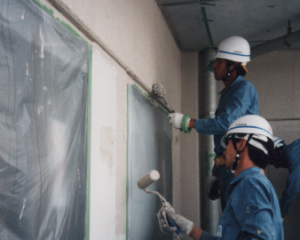 As seen in the image below (right), the person in the foreground is painting with the pressure feed roller while the other two at the back are using extra rollers, three of them, sharing the same paint. The two additional painters make the job gets completed earlier. ① Cover a wide area in a short amount of time. ② No paint pails nearby for a safer working environment. ④ Paint can stay at one place without taking much space. ⑤ Hose can be extended longer than 100m for a large-scale painting job. Diaphragm airless paint sprayer has no sliding like piston airless, so it is possible to use coarse paint and suitable for various kinds of painting job. Applicable for specialized paint and high viscosity paint. 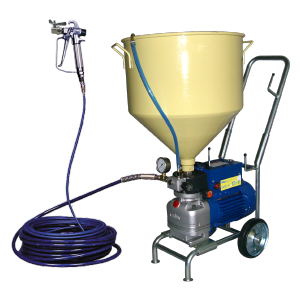 TB-8, a high volume diaphragm airless paint sprayer, can be used to spray specialized paint such as elastomeric filler or ceramic tile base without the need of a compressor. It also works for paint from low to high viscosity paint and the recently in-demand thermal barrier and insulation paint. For professional painters, a airless paint sprayer, a high pressure washer and a compressor are 3 indispensable apparatuses in their job. For new construction buildings, wall cleaning prior to spraying is not necessary. However, for a used building or renovation work, a thorough cleaning using a high pressure washer is advised. Spray painting can begin once the wall is completely dry (similar to the washing one’s face before putting on make up). If the base is not properly cleaned, the paint will peel off easily. When pattern spraying is required, it is necessary to use a compressor to achieve a better result. 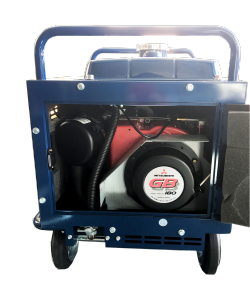 Compressor supplies the required air for pattern spraying to get concrete effect or imitation granite surface. Here, let us introduce Japan’s most lightweight and smallest sound-proof high pressure washer and Japan’s most silent compressor (both compared to machines with equal specifications). Carrying the same power and capability as its peer, the weight is held at 49kg. As pictured below, the washer is installed with 4 large magnetic doors for easy maintenance. Carburetor checking or spark plug replacement can be easily done by just opening the back door as shown in the picture below. Moreover, on the left side of the washer, a large size recoil fan and a shielding plate are equipped to decrease the heat by 10℃. With this, overheat can be avoided and the pump will last longer. We have receive testimonials from our customers benefited from its noiseless feature and one of them is as below. The site was situated in a kindergarten located in Japan’s 2nd largest metropolitan, the densely populated city of Osaka. The air compressor is so silent that while the machine is running, the little kids from the kindergarten can sleep soundly during their afternoon nap. 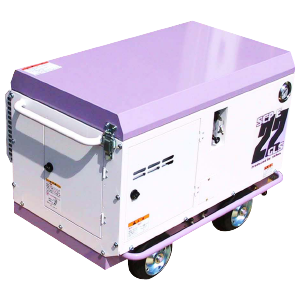 Not only does SCPE-22GLS is popularly recognized for its noise-proof feature, but also for its cooling construction system. With the cooling construction, there is no trouble with the machine being overheat or temperature rising inside. Referring to image below, when the air compressor is running, the air filter may get hot, but you can touch the cover safely. In addition, gasoline can be refilled from the outside without opening the cover as below. 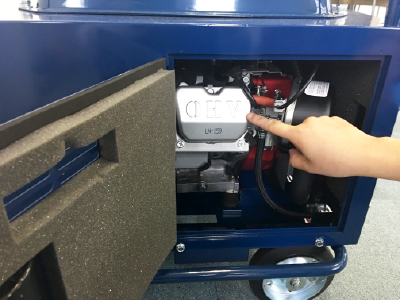 Referencing to the self-explanatory image below, the air compressor is using a high durability engine; it is 5 times more durable compared to previous model. 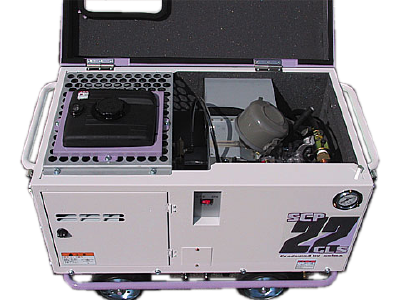 SCPE-22GLS is your choice for a total silent and high durability air compressor.